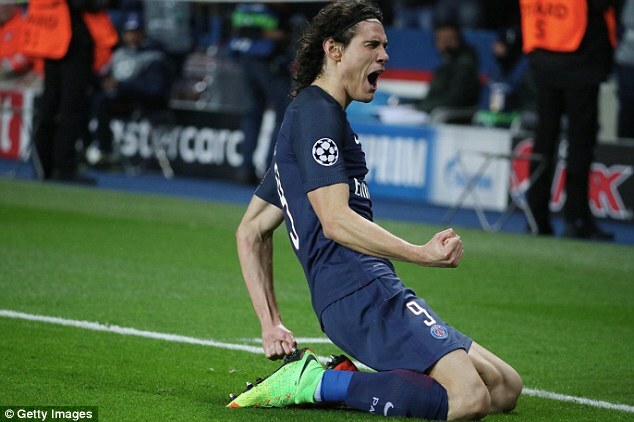 The only notion of anything relating to Valentine’s Day at the Parc des Princes on Tuesday was the massacre Paris Saint-Germain handed out to Barcelona in their Champions League tie. 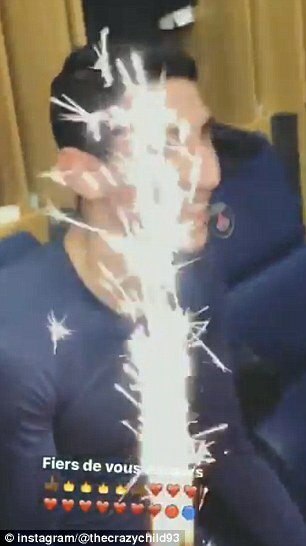 But on a night when Angel di Maria and Edinson Cavani celebrated birthdays, the pair were given the priceless gift of a Barca capitulation as the duo played key roles in the French side’s stunning 4-0 last-16 win. Di Maria scored a free-kick and a stunning 23-yard strike on his 29th birthday, while Cavani, a year older, completed the rout by netting the fourth 19 minutes from the end. 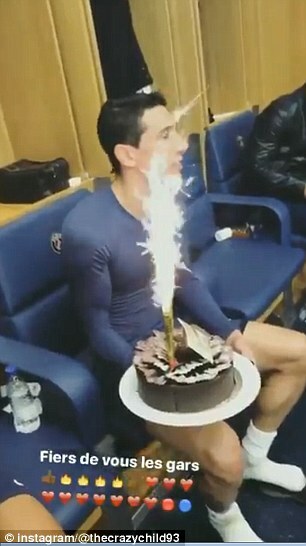 Having sparkled on the pitch, the South American duo then celebrated the victory and their birthdays in the dressing room post-match with a cake lit up just as brightly as they had illuminated the Parc des Princes turf earlier. Di Maria needed just an hour to humiliate the Spanish champions before being replaced to a standing ovation and admitted that it capped off a perfect evening. ‘It was a very special day,’ Di Maria said. ‘It’s impossible to have a better performance and birthday. It was a wonderful display and fully deserved. ‘We controlled the game for 90 minutes. It was hard to control Neymar, Luis Suarez and Lionel Messi but we managed it in the end. ‘We covered so much ground, got the win and took a huge step forward. We’ve been showing this (quality) for a few years now. Julian Draxler was also on the scoresheet for PSG to help inflict the joint heaviest ever Champions League defeat on Barcelona. No side has ever come back from 4-0 down in a first leg Champions League tie, making PSG almost certainties to progress to the quarter-finals ahead of the second leg in Barcelona on March 8.